While Anatomical terms of motion describes all possible movements of the body, let's narrow down on those that are useful for skiing and relate them to actual skiing movements and techniques. These are the basis for biomechanics, afterall. First, note that here we will look at the movements we can make, the motions of different joints and body segments and how these relate to skiing, not to general principles of physics like "force" etc. Also, note that while the motion is usually analyzed in the context of the plane of the respective joint, we will look at the planes of movement in relation to the skier, aka the entire body. So, for instance, while flexion/extension could be considered angular motions when related to the specific joints, we will look at them as occurring in the vertical plane. It is important to note the difference between passive and active movements. For instance if you flex the knee and hip (to bring femurs at 90 degrees) and then rotate the femur, as active movements, the tibia will adduct/abduct, as a passive movement. In skiing, although not always easy to control or recognize, the distinction between passive vs active movements is an important one. Here's a tip: when analyzing or learning skiing, always start from the snow up, as we will do below. Inversion is what we do with the inside foot, while eversion is what we do with the outside. See Inversion and eversion and We ski with the feet and ankles. These are at the movements at the base of the "kinetic chain" and are then complemented by moving the knees and femurs (active or passive). We use these to put the skis on and off the edge and fine balance adjustments. These, as you can guess, are very useful for fore-aft and pressure adjustments. Dorsiflexion, i.e. "closing" the ankle will tend to put the hips more forward, while plantar flexion, i.e. "opening" the ankle will put the hips further back, depending on how flexed the leg is. These are a big part of why Keep your feet underneath you is important. When in closed chain mode, i.e. the skis are weighted, these movements are not very strong, as we try to leverage the skis and boots to bring the body forward or back. In open chain mode, when the skis are unweighted, these can have a large impact on fore/aft adjustment, together with with moving the boots fore/aft. These two movements are also important for pressure application and fine adjustments. One could apply more pressure to the tips with plantar flexion (i.e. "pedal") but the reaction to that will be to move the hips even further back, so it should only be a temporary adjustment. Then, moving up the kinetic chain, we have flexion and extension of the legs (ankles, knees, hip), these are great for staying in balance and flexing. Flexing the knee is not a movement that happens in isolation - we need to flex/extend the ankles and hips as well, to stay in balance and keep our feet underneath the hips. We call this entire set of movements flexing, as in flexing the leg and we call its opposite: extending the leg. In normal every day chat, you'll hear these referred to as short leg and long leg, i.e. flexed and extended. It is important to note that the flexing and extending of the legs are independent movements of each leg... you can see both in the photo above. They're not just moving the COM (Center Of Mass) in relation to the BOS (Base Of Support), but sometimes simply the feet in relation to the hips (as the skier is on the outside ski exclusively, so flexing the inside ski has nothing to do with BOS) or just allow the hips to drop/move inside and increase edge angles, as above (again, flexing the inside leg). In fact, quite often, flexing and extending are not about the BOS and the COM but simple anatomical needs when moving and skiing, such as flexing the inside leg to increase angles, so we focus on the movements themselves and how they relate to good skiing in many ways, as opposed to just COM/BOS relationship in the vertical plane! Here's a trick question: above... did the femurs rotate and the tibias abduct and adduct or did the upper body move laterally? It does look like the legs moved under a stable upper body, doesn't it? Is the femur rotation there passive or active? Is there any inversion of the foot? Do you see any dorsiflexion? You may be surprised what it takes to ski with good ski performance! (The answer is yes to all those questions! With the huge range of motion at the hip joint, the hips and femurs play a central role in skiing, with flexing and extending (folding or hunching at the hip) as well as sideways. Separation of the lower body from the upper body is a critical principle for effective skiing and we minimize stress and bending of the spine, so the upper to lower body decoupling should occur mostly at the pelvis, between the femurs and the hips. What do you think? That stress you feel in your core and upper body to keep it upright at the apex - is that passive? The frame of reference is not just space. It's also about time and leverage - they make a big difference. Member-only content avilable (143 words). Back to our trick question: do the femurs move under a stable upper body (as it seems to an observer) or did the skier actively move the upper body as well? The upper body is connected to the lower body, so the most natural thing for it to do is to follow the lower body: if the skis turn, the shoulders tend to turn as well. If the legs incline into a turn, the body tends to incline. To create or maintain separation, the upper body must actively counter the lower body. Here are some of the important muscles and their uses in movement. The quads are involved in extending the knee while the hamstrings are involved in flexing the knee and pulling back the feet. The functions of the glutes includes extension, abduction, lateral(external) rotation and medial (internal) rotation of the hip joint. The gluteus maximus also supports the extended knee through the iliotibial tract. (source: Wikipedia). 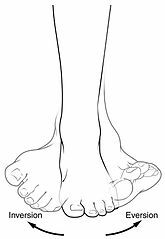 The calf muscle is involved in stabilizing the ankle and plantar flexion. The tibialis anteriori muscle is very important, as it is responsible for both dorsiflexion and inversion, in open chain mode. In closed chain mode it helps balance the leg. The kinetic chain is the interconnection of all the body's elements and how they move and affect each-other. One important thing to note is that movements at different joints have different effects (and take different muscle activations) when performed in open chain mode (i.e. the joint is not under weight) versus closed chain mode, where the joint is weighted - especially for the feet and ankles. For instance, am I doing a low-energy turn, where flexing is more like a squat, i.e. relaxing the feet allows the body to drop? Or am I in the transition between two high-performance turns, where I am unweighted and flexing is more like retracting the feet up? The other aspect, critical to high performance skiing is that the range of motion and the effort it takes are different in the different open/closed modes. Translated in normal speak, this means for instance that you can't tip the feet on edge quickly, if you're putting the entire body weight on them. You can't release the outside ski if you don't relieve some of the pressure on it etc. Understanding and focusing on the movements that create expert skiing is very important for any skier. Decomposing great movement into components and working on each component, to learn it and refine it, is how we evolve into expert skiers. Viewed 2272 times ( | Print ) this page.